I guess being literal has its merits sometimes, but when I see an old-timey historical image of people with ostrich-feather hats gambling on a book that is subtitled "The History of Gambling," I pretty much pass out from boredom, right there in the middle of Borders. To be fair to the designer, though, this might be tougher than it looks. The title refers to dice games and dominoes; the subtitle is much broader (all sorts of gambling; here's the review). With such a wide scope, I think it would have been more fruitful to try to communicate something about the nature of gambling, instead of concentrating on depicting the games themselves. Just like, for example, a history of war shouldn't have a picture of World War II on the cover. I love this. I think it's so handsome. I don't care if it does illustrate just one form of gambling--It makes me feel good to look at the cover. Sorry, I hate to criticize, but... it's not just a depiction of gambling, it's a very famous painting, "The Cardsharps", by Caravaggio. It does say something about the nature of gambling; the richly-dressed guy on the left is being scammed by the other two -- see the hand signals and the card the guy on the right is pulling out of his pocket? Their ripped, mismatched clothing indicates their lower class. This is a picture of a rich guy who's getting ripped off and doesn't know it. In this case, the nature of gambling is not just the luck of the cards or the skill of the player; there's actually no way this guy can win. Still, I don't know anything about graphic design, and my only qualifications are a career in bookselling and a minor in art history. Most people probably don't know anything about the painting, so your interpretation that it's just a depiction and not a commentary on the nature of gambling, is probably valid to most people who will view this cover. Andrea: Criticize away! That's what we do here :-) Constructive and informed criticism, of course. Your comments are great and certainly help me reconsider this cover, or at least the inclusion of the painting in the design. If I didn't know you had a minor in art history, I might think you had a minor in gambling! Thanks grandma blue and andrea--I'm the author of the book, and I'm glad you like it. I can't take credit for the cover image--my editor, Brendan Cahill, had the idea of using the Caravaggio painting. My original idea was to use a somewhat well-known scene from a Greek vase showing Ajax and Achilles rolling dice--let's just say that I'm glad it was Brendan's call and not mine. 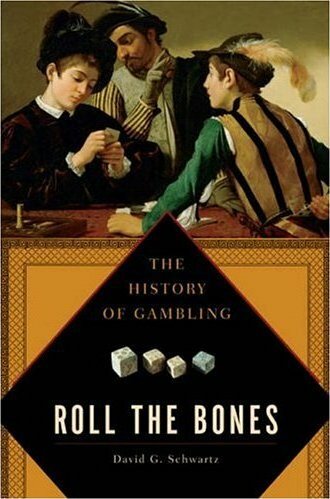 The problem with writing a "serious" book about gambling history is that most books about gambling are how-to guides. As you can tell from the review, this is a pretty ambitious work--approaching the global history of gambling from a scholarly perspective. So Brendan and the design team wanted a cover that communicated: a) this book is about gambling, and b) this is a serious, well-researched book. As the author, I am positively thrilled with the job they did. This is my third book, and the only cover that I unambiguously can say that I love. IMHO, Gotham did a fantastic job with packaging the whole book. If you want to see a really "literal" cover, take a peek at my previous book, Cutting the Wire. Luckily THAT one didn't make the Times book review, or I don't think I could ever post here without a public act of contrition. Like Andrea, Joseph, I do not come to criticize, but to share a little of my perspective. I really like your site--I wish more publishers would read it, and see just how important cover design is. And Andrea, I've been looking at this painting almost every day for quite a while, and I've probably thought too much about it, but I'm starting to think that the dupe is deliberately not looking up, because he suspects he is being cheated, but just has to keep playing. I'd be curious in hearing back from you with some choice words about "Cutting the Wire." And I'd love to get your read on my first book's cover, which is very...pink. My email is on my site, www.dieiscast.com.